Even before the UN Ocean Conference in early June, we already knew about the disastrous ways in which plastic affects the world's oceans. Billions of pieces of plastic are floating in the oceans. Their effects are also sufficiently well-known: marine animals swallow them or get tangled up in them, which causes them to die in agony. On the other hand, we know less about the consequences of the smallest pieces of plastic, known as microplastics. Empa researchers have now started to investigate how microplastics are generated and where they actually come from. The presence of microplastics in our wastewater can be attributed primarily to two factors. Firstly, many cosmetic products, such as toothpaste, creams, shower gels, and peelings, contain tiny pieces of plastic in order to achieve a mechanical cleaning effect. Secondly, microplastics are washed out in the process of washing polymer textile clothing, and thus they enter our environment via wastewater. Many researchers who have recently studied nanoparticles are now also investigating microplastics. They include Bernd Nowack, Edgar Hernandez, and Denise Mitrano (who is now working at the water research institute Eawag) from Empa's "Technology and Society" department. On the basis of their nanoparticle research, these three researchers recently published a first quantitative investigation of the release of microfibers from polyester textiles during washing, in the specialist journal "Environmental Science and Technology". In this study, the Empa team primarily investigated the ways in which washing agents, water temperature, and the number and length of wash cycles affect the release of microfibers. To date, the study is the most meticulous and systematic investigation of the release of microfibers from textiles that has ever been carried out. This applies both to the quantity of parameters investigated and to the characterization of the released fibers in terms of number and length. Nowak and his colleagues found out that the quantity of fibers released by five different washing programs was always more or less constant, while washing agents and detergents increased the quantity of microfibers released compared with "normal" water. However, washing temperature had no effect on the number of microfibers that Nowack's team subsequently found in wastewater. Remarkably, the same was true of the duration of the wash cycles. "And for us, that was really quite astonishing," says Bernd Nowack. He had assumed that they would confirm the well-established hypothesis that the longer a wash cycle lasts, the more microfibers it will release. "At first, it looked as though microfibers were generated during washing," says Nowack. However, if this were the case, longer wash cycles should release more fibers. But this is not the case. The Empa researcher makes a frank admission: "Unfortunately, this means that we are not yet able to explain how the released fibers are generated." To ensure that this does not remain the case, a follow-up study is already planned. In cooperation with Manfred Heuberger of Empa's "Advanced Fibers" lab, a PhD thesis on the generation of microfibers during washing will soon be underway. 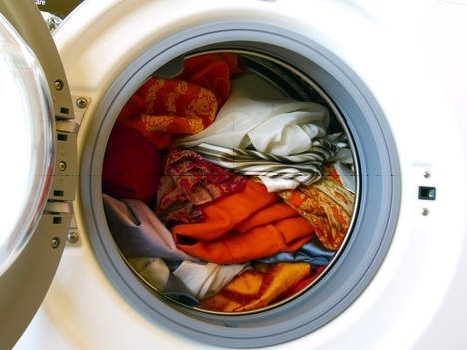 This study will then systematically analyze different types of materials in order to shed light on the generation of microfibers in the washing machine.